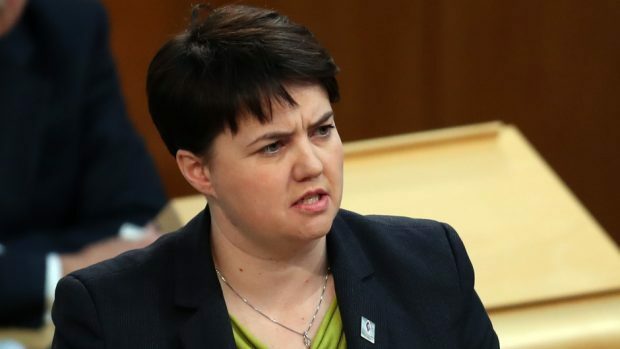 Boom and bust teacher recruitment has left Scotland with thousands of vacancies, according to Scottish Conservative leader Ruth Davidson. The accusation followed on from education secretary John Swinney’s admission cuts to teacher training places five years ago probably went too far at Holyrood’s education committee earlier this week. Speaking at First Minister’s questions, Ms Davidson asked Nicola Sturgeon to admit her government had got things wrong. She said: “It is quite simple: the Scottish National Party government did not listen to warnings from the chamber or from student leaders, who called for an end to boom and bust methods towards teacher training. “First, it brought on too many trainees, with the consequence they ended up in dole queues and not in the classrooms. “Then it cut the numbers too drastically, with the consequence we no longer have enough teacher – we have 4,000 fewer than when this government came to office. Ms Sturgeon said: “No. As those who were in parliament at the time – back in 2010 and 2011 – will recall, at that time we had a significant issue with teacher unemployment. “It was thought we had a surplus of teachers coming out of the system, many of whom were struggling to get jobs, which is why we took the action that we did. Ms Sturgeon went on to highlight Scottish Conservative comments at the time calling for a review of teachers’ conditions. She said: “I will tell the chamber who we did not listen to back in 2010: we did not listen to the Tories. Ms Davidson said the first minister must accept responsibility for poor workforce planning. She said: “The line on education from this first minister seems to be we should forget about 10 years of failure, forget about the mess that the government has made and forget about the children who have been failed by it, and that she is the person to sort it out. “If she is going to do that, she first has to admit the consequences of getting it wrong. “She needs to admit that her government’s workforce planning has been disastrous and what that means. Ms Sturgeon said: “The last point that I will make to Ruth Davidson is this: while I take absolute responsibility for everything this government does, over the next seven days, we need to make sure that we do not end up with another Westminster government that is taking action and making cuts that are likely to push an additional one million children across the United Kingdom into poverty.